Born in South Africa, Elon Musk moved to Canada and in 1992 to the United States. After getting a PhD in applied physics and materials science at Stanford University, he founded his first business, a web software company, in 1995 with his brother. The company, Zip2, was acquired by Compaq in 1999 and Musk’s share in that deal was $22 million. With $10 million of that money, he went on to co-found X.com, a company that later merged with Confinity, whose product was a money transfer service called PayPal. Even though he was replaced as CEO in 2000, he was the largest shareholder and when PayPal was acquired by eBay in 2002, his paycheck was $165 million. Again, he didn’t sleep on that money and followed his passion for physics and his dream of changing the world and founded two companies whose purpose was to revolutionize the way people travel (both on and off this planet). These two companies are SpaceX and Tesla. SpaceX became the world’s largest private producer of rocket engines and Musk’s vision in developing the company was heavily influenced by Isaac Asimov’s Foundation series. The company’s goal is to reduce the cost of human spaceflight ten times and also to help achieve Musk’s dream of a human colony on Mars by 2040. During a talk at SXSW, Musk actually stated that he’d like to die on Mars, “just not on impact”. As for Tesla, the company was founded in 2003 and Musk joined the team a year later as the controlling investor and chairman. Tesla was created as an electric car company but is now also producing energy storage solutions and solar panels. One of its products, the Tesla Model S car was the world’s best selling plug-in electric car in 2015 and 2016. 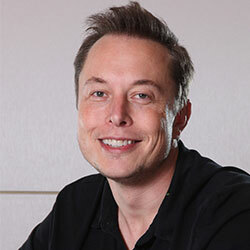 Other companies founded by Elon Musk include SolarCity (provider of solar power systems, later acquired by Tesla), Hyperloop (a high-speed transportation system), OpenAI (not-for-profit artificial intelligence research company), Neuralink (whose purpose is to integrate artificial intelligence with the human brain) and The Boring Company (produces tunnel boring machines). How did Elon Musk manage to do all that? Well, one thing he always mentions is books. And we’re not talking just about business books, it’s like the Elon Musk books. Ever since childhood, he has been an avid reader and attributes a large part of his success to reading. There are also a few books written about him, the most popular one being Ashlee Vance’s Elon Musk: Tesla, SpaceX, and the Quest for a Fantastic Future.